Think of a rainforest and you imagine tropical heat, howling monkeys, scuttling insects and colourful birds. But a rainforest doesn’t have to be hot – there’s also another, lesser-known version, the temperate rainforest. They’re both packed with natural riches and share the same high rainfall of 250–450cm a year, but where the tropical version is hot and steamy, the temperate version is cool and damp. 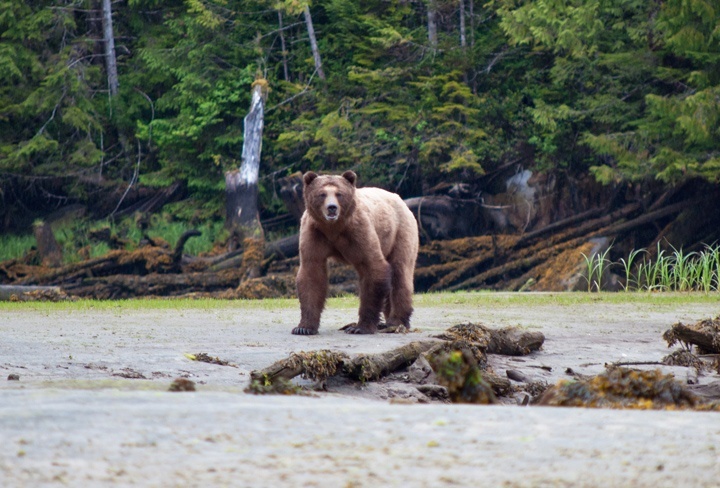 There are only a few left in the world, and the largest stretch of coastal temperate forest still remaining is on Canada’s west coast – the Great Bear Rainforest. A unique ecosystem where land, sea and rivers come together, it might not be as famous as the Amazon but that makes it all the more interesting to discover. The Great Bear Rainforest covers 12,000 square miles from the border with Alaska in the north down to Campbell River in the south. Its forests are packed with ancient cedar, fir and spruce trees, and home to thousands of plant species and 350 different birds and mammals. There’s everything from cougars to wolverines, but the heart of this forest is the bears which give it its name. Grizzly bears are most common, but if you’re really lucky you might see a rare white Kermode or spirit bear. 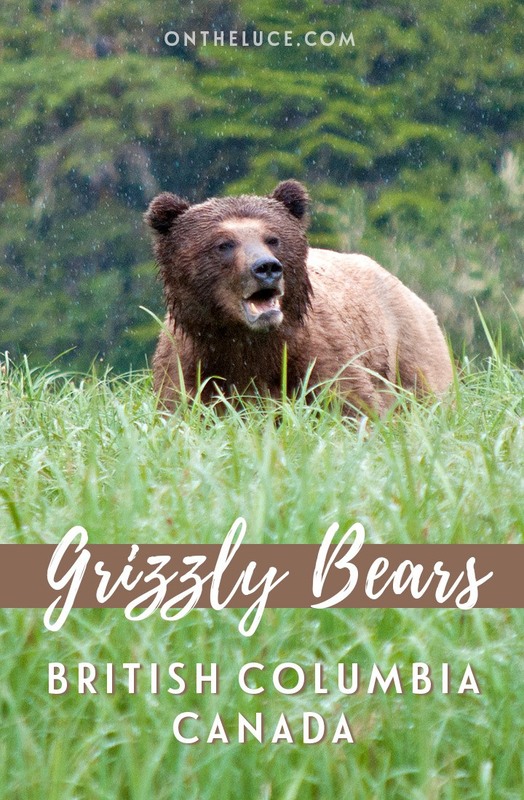 Grizzlies originally roamed all along the coast of North America – from Alaska to Mexico. But now their territory is ever-shrinking, leaving just patches in Alaska, Canada and the North-Western USA. The forest’s drowned trees make great homes for salmon and where you have salmon you have bears. But would we see any ourselves? 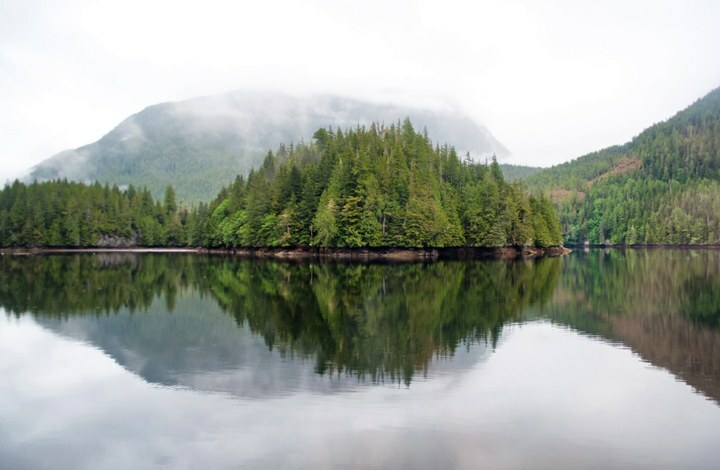 You’re truly out in the wilderness in the Great Bear Rainforest – no tour buses of sightseers out here. Visitor numbers are limited to minimise the impact on the bears which helps you get a better feel for this magical landscape. The area is so remote that there are no roads, so everything is brought in by boat or seaplane, including us. 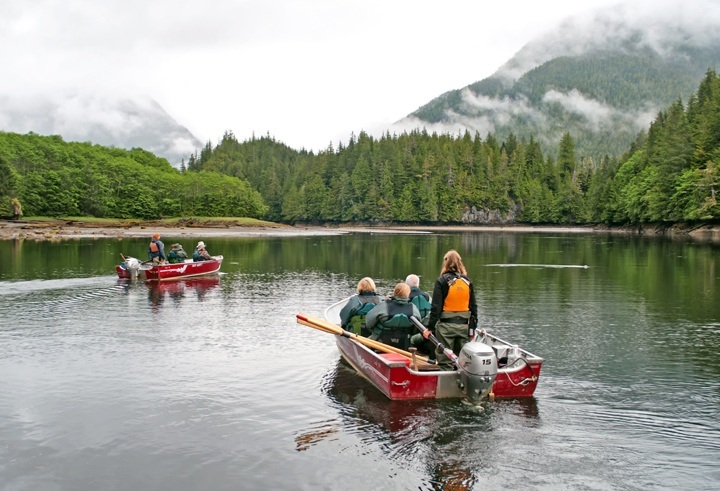 A 35-minute float plane journey took us from Port Hardy out into the rainforest to our floating base for the next few days – the Great Bear Lodge. On the flight over you could see down onto dense woodland, rivers, fjords and islands dotted in the water, with the landscape a whole palette of shades of green. Other than a few old logging huts, there was no sign of human life at all, just unspolit nature. During the autumn bear-watching takes places from hides on the riverbank, so you can see them catching salmon making their way upstream. But in spring it’s from small boats so you can see the bears on the water’s edge where they’re feeding on sedge. 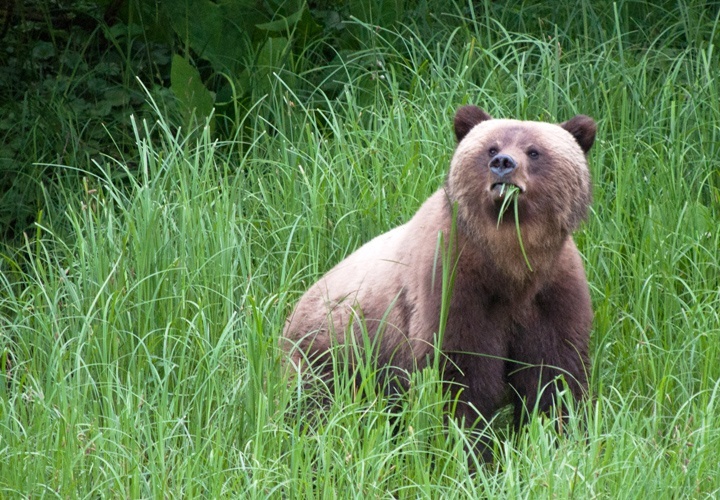 A type of grass, sedge is 26% protein, but a bear’s a big creature so they spend hours each day eating to fill themselves up. Keeping our fingers firmly crossed for a bear-sighting, we kitted up with plenty of warm and waterproof layers and set sail into the rainforest. The one thing that you’re guaranteed to get in a rainforest is water, and even when the rains held off you could feel and see the moisture all around you. Air flows in from the sea and hits the mountains, forcing it upwards so it condenses and creates a constant stream of clouds and rain. It’s a watery world, with low clouds draped between the mountain tops and streams trickling down from the hills. The whole area is tidal so the water levels are constantly changing, sometimes the currents swirled around us and sometimes it was as still as a pond. The landscape changes too, with mud flats and beaches disappearing with the rising tides and submerged trees draped in moss emerging from underwater as the tide went out. We sailed silently through a watery maze, from wide open stretches to narrow channels just big enough for the boat. All you could hear was the splash of water from the oars or an occasional bird call to break the peace. After a while I found myself drifting into almost a meditative state, lulled into semi-consciousness by the rhythm of the boat. But not quite – there was always one eye fixed on the shoreline, scanning the grass and overhanging trees for bears. And we didn’t have to wait too long until our first grizzly sighting. As we floated along a pair of ears popped up from a clump of sedge and with a whisper of ’Bear!’ the boat was suddenly on high alert, cameras at the ready. A head followed the ears and all at once we were eye to eye with a grizzly bear. She gave us a quick once over, decided we weren’t at all interesting and went back to the more important business of eating. We were so close we could see her claws gripping the sedge and hear the leaves tearing and the sound of her munching. With her pale fluffy fur and protruding nose she looked so much like a teddy bear – just a lot bigger and with some scary-looking claws. Full of sedge for now, she moved closer towards us and the whole boat held it’s breath as she walked down to the water’s edge and took a long drink. We sat and watched her until the light started to fade and when she finally ambled back into the undergrowth there were grins all around – we’d seen our first bear, but it wasn’t to be our last. The next day we came across an long-legged adult male sauntering across the beach with that distinctive bear’s pigeon-toed walk. And a handsome deep brown male buried a field of sedge, eating away oblivious to the falling rain. Over the years the lodge has been here the staff have got to know many of the bears, seeing their personalities develop. For us it was such a privilege to get close to these amazing creatures even briefly and to get a glimpse into their worlds. 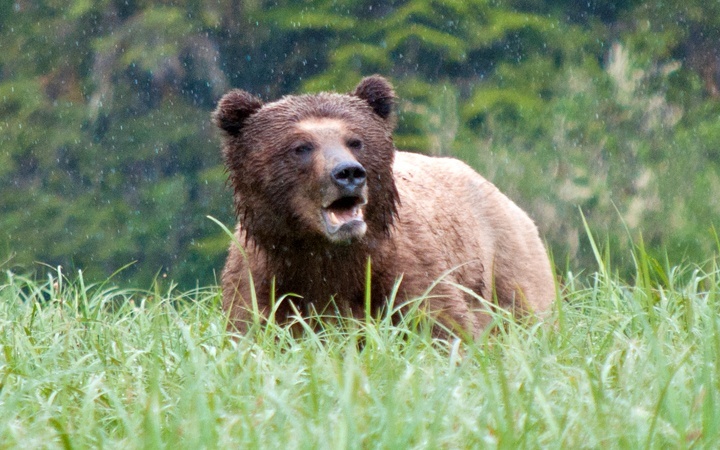 But the Great Bear Rainforest isn’t just about bears, there’s a whole interconnected ecosystem of plants and animals. Back on land, Great Bear Lodge’s naturalist Tom took us out for a walk into the rainforest to discover some of the different species that make it their home. The bears might look like giant teddies but they are a real danger, and Tom told us terrifying tales of a near miss with a male nicknamed Predator. But generally they stay out of the way of people, but the guides called our ‘Hey Bear’ and kept a peppery bear spray close to hand, just in case. Though we didn’t see any bears, there were signs of them all around, when you knew where to look. That hollow at the base of a tree is a bear’s day bed, where it snatches some sleep. That battered looking tree is a rub tree, which bears use to leave messages to each other. We were introduced to some of the forest’s smaller creatures too, like the orange and black Varied Thrush with its sing-song call. 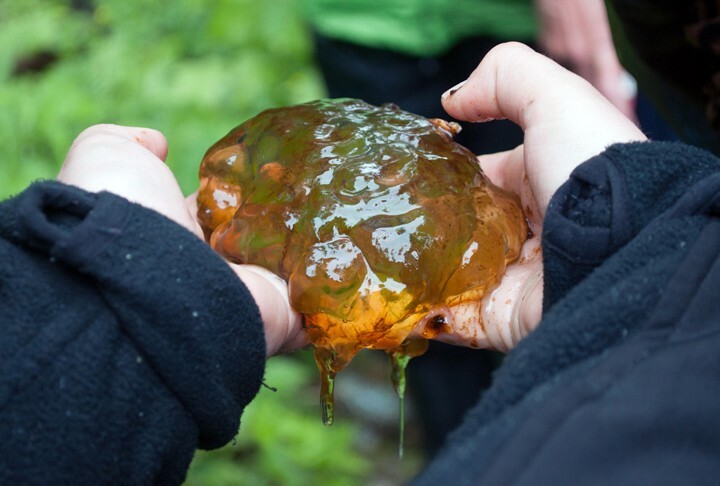 We also uncovered a mass of spawn from the Northwestern Salamander, laid in one of the forest streams. Although it looked like a blob of jelly there were actually thousands of salamander eggs inside, each less than 2mm in size. Then there was the bizarre Banana Slug, with secretes anaesthetic mucus, which one of our guides bravely volunteered to demonstrate – on her top lip! There are so many interesting species in the forest, and more being discovered all the time. 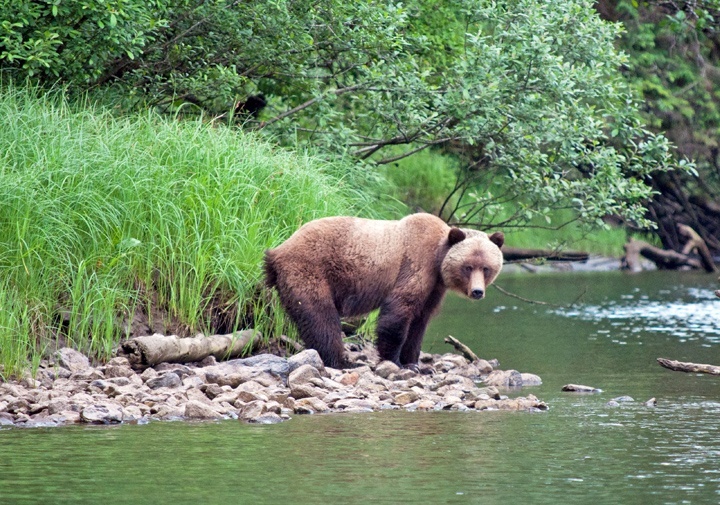 It might be the land of the grizzly, but there’s so much more to the Great Bear Rainforest than just bears. What an amazing experience you had! One many Canadians have not had. The pictures and article make an excellent post. Thanks Darlene, it was a really amazing experience, really breathtaking! Great post Lucy, you got some excellent photos of the bears. I was lucky enough to see black bears on a boat trip out of Tofino on the island. https://smallbluegreenwords.wordpress.com/2013/07/08/were-gonna-go-on-a-bear-hunt/ even from a distance it was a breathtaking experience. Canada has some of the most wonderful natural landscapes. 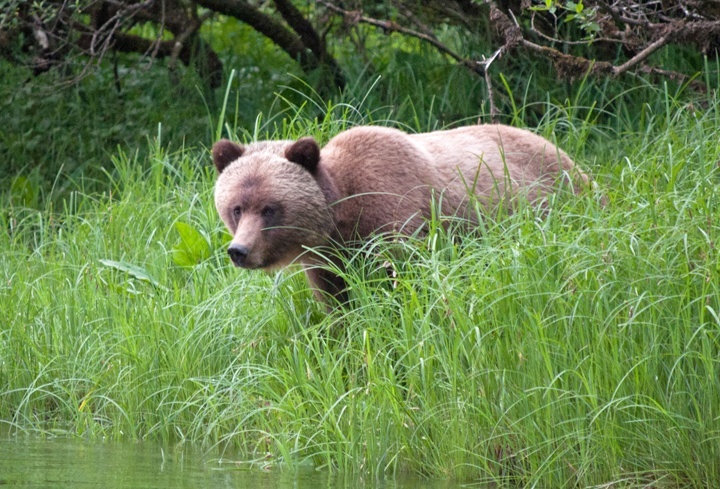 Thanks Jude, love your black bear pictures too – I will definitely have to visit Tofino when I’m next in that part of the world, so much more to see! The island is definitely worth spending more time on. 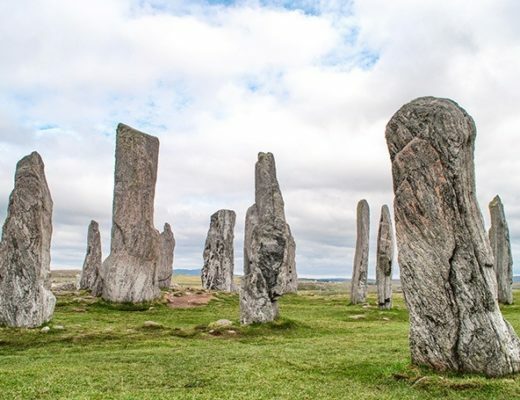 This looks like such an incredible place to visit and I would love to go myself! 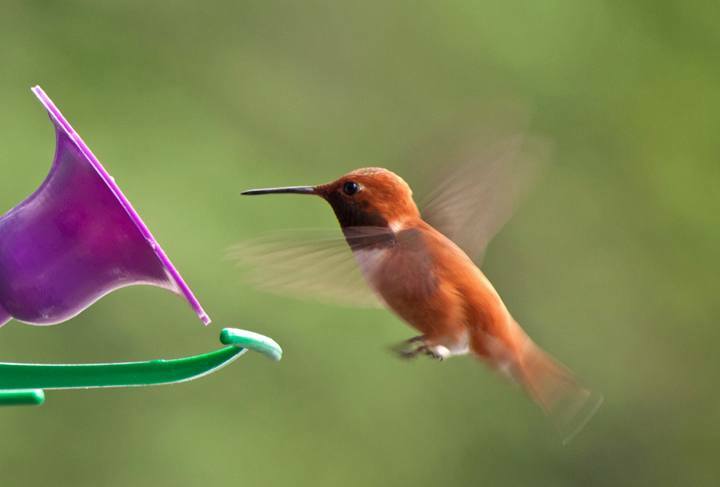 Such a fantastic adventure and stunning photographs – especially the one of the hummingbird! It was really fantastic – the lodge we stayed at was lovely too (post about that coming up next month! ), it was so remote and beautiful out there, you really felt like you were in a different world. Thanks, yes I really was – they were so graceful and totally unbothered by us. The hummingbirds were more difficult to photography, they were so quick! What a fantastic experience, Lucy! You had some amazing bear encounters, and you captured them beautifully. 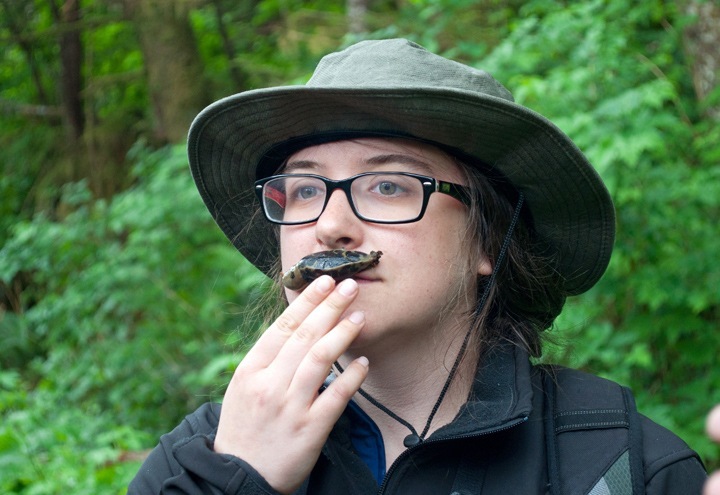 I have seen a lot of banana slugs in my day, but I’ve never once thought about putting one on my lip! Great post! Haha, I can see why it never occurred to you! Not sure I’d have wanted to put it on my lip either but it was interesting to watch someone else do it! 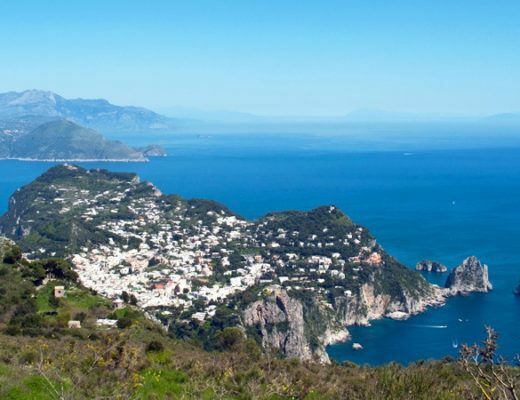 Thanks Sheila, it was an amazing experience – you live in a beautiful part of the world! We had such a good taster of the region and were so lucky to see four bears in two days, but only just scratched the surface of the area I know – and I’ll definitely be back! What incredible photos – I love the bears and such an amazing experience to see them in the wild. They were so stunning – I did a bit of an impulse purchase of a second-hand zoom lens the day before we went and was so glad I did! Such a wonderful experience to share with you. I’m sure we will remember it all our lives. Hope we get to share some more adventures together sometime. It really was amazing – and yes here’s to lots more trips together! Sounds so wonderful Lucy, it reminds me so much of my holibobs there twice. This is so beautifully written and your photos are stunning! We’re off to find grizzlies in Finland next year, and (of course) I’m super excited, but oh to go back to the wilds of BC! It is a wonderful place, something I’ll always remember. Good luck with the grizzly spotting in Finland too! There were about 50 shots of that empty bird feeder to get one with the hummingbird in – those things move fast! That was an awesome post! Great description of the trip and fantastic photos! This was not even on my radar, and now I may have to add it to the (ever-burgeoning) list. Thanks – I knew so little about the area before I went but it’s a magical place, hope you get to make the trip one day! Thanks Gary, it’s such a fascinating place! Amazing to get so close to bears in the wild, not so sure about the slug moustache though! Yes I’m not the biggest fan of slugs so no way I’d be getting that close to one! What an incredible experience Lucy and such an interesting post – photos are pretty amazing too! There’s no better way than seeing wildlife in its natural habitat like this. Thanks Suzanne, it was amazing to see the bears up close! How incredible to get so up close to nature! I love the picture of the hummingbird. Thanks, loved the hummingbirds, such pretty little birds! Great experience, Lucy! We’be been there last year in autumn and totally fell in love with this beautiful area. We did not only see Grizzlies and Black Bears, we had an incredible encounter with a Spirit Bear. If you like to, hsve a look at my blog, I wrote about it. I will go back there next year, can’t wait for it! It’s one of the most amazing places on earth to me. It is such a magical place, I would love to go back in autumn sometime and see the salmon fishing. That’s amazing that you saw a Spirit Bear, how incredible, love your pictures, what a beautiful creature! Wow, such a great post and I adored your pictures. Must be so amazing to get that close to a bear. Its been a good few years since I visited Canada, but I loved its rainforests – I went to see the giant trees just on the outskirts of Vancouver. Now I’m feeling desperate to head back! Thanks Keri, it was a fantastic experience – and I just loved Canada, would love to go back and see some more! I just ran across your blog, and have to say I’m a huge fan. Canada looks gorgeous and I hear nothing but good things! I definitely need to plan a trip up there in the near future. Thanks Austin, yes Canada really is a beautiful place – hope you get to visit sometime soon. I’m already planning a return trip!